All of our doctors are fully licensed to treat and manage full scope optometric care. We specialize and treat All Vision Disorders and Diseases of the eyes including Cataracts, Glaucoma, Macular Degeneration, Retinal Complications, and Corneal dystrophies. “Dr. Kelly” graduated from the Ohio State University receiving his Bachelor of Science of Physiological Optics and his Doctor of Optometry degree in 1972. He began practicing in downtown Canton in 1972 and did so there for 20 years. In 1993 Dr. Shaheen moved to the current location on Hills & Dales Road which was an old bank building. They renovated and expanded it to what it is today. 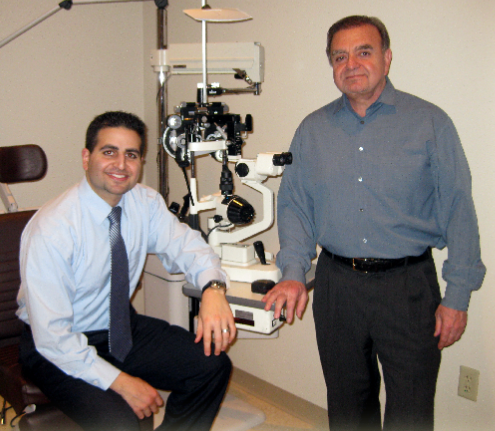 Dr. Shaheen is a member of the American Optometric Association and Ohio Optometric Association of which he proudly served as past zone governor. Dr. Shaheen has spent countless hours volunteering and serving in the community. He is also a charter member of Canton South Rotary Club, and the Paul Harris Award recipient as well. He is married to his wife Rhonia and has two children Dr. K.J. II, and Kayla. He enjoys playing tennis and golf in his spare time. “Dr. Mike” graduated from Ohio State University, receiving his Doctor of Optometry degree in 2009, and did his undergraduate studies in business marketing. Upon graduation he returned to his home town of Canton to join his uncle and practice at Hills & Dales Vision. Dr. Mike is also a member of the American and Ohio Optometric Association, and loves presenting “Realeyes” presentations to the local schools. He enjoys spending time with his wife and two children, and being together with family. “Dr. K.J.” received his Bachelors of Science in Biology from Ohio State University in 2010. He then attended Optometry School at Indiana University, graduating in 2014. Upon graduation, Dr. K.J. was excited to return home and work alongside his father and cousin at Hills & Dales Vision. Dr. K.J. teaches at East Coast Martial Arts and has been there for over 20 years, and has earned his fourth degree black belt. He also enjoys playing tennis and golfing along with presenting “Realeyes” to local schools. He is a member of the American and Ohio Optometric Associations.